10 Questions to Ask Before Hiring an Estate Planning Lawyer | The Levin Law Firm - Philip Levin, Esq. Hiring an attorney to guide you through the estate planning process does not have to be a fearful experience. Instead, it can be the most empowering decision one makes to provide necessary counsel and advice. 1. Do you prepare a comprehensive plan for the care of my child(ren), if something happens to me, that names both short and long-term personal and financial guardians and gives specific instructions to these guardians? 2. Are all of your fees flat fees? What about for ongoing work after the initial completion of my estate planning documents? What happens when I call with legal questions two (2) years after my estate planning documents were completed? What if the questions are about something other than my estate plan? 3. Do you have a knowledgeable team in place or is it just you? What happens if something happens to you? 4. Do you make sure my assets are titled properly? How? 5. What happens when things change in my life? Do you notify me about changes in the law which might impact my estate plan? How often do you communicate with me? 6. 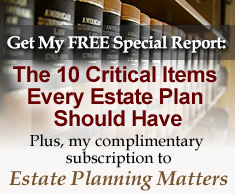 Does my estate planning fee include a regular review of my plan? What if I want to make changes to my plan? 7. Do you have an “Estate Planning Client Care Program” for your clients and, if so, what does that include? 8. Do you have a process for helping me capture and pass on my “intangible wealth”, such as my spiritual, moral beliefs, and what I believe is most important in life, which I also want to pass on to my family? 9. Can you structure my estate plan so that property I leave to my family will be protected from potential lawsuits, as well as distributed only to my immediate family members, if one of my children or grandchildren should ever get divorced in the future? How do you build that kind of protection into a client’s plans? 10. Can you help me make smart choices about things like reducing estate taxes, saving for college education expenses, and strategies designed to allow my retirement plan assets to become a lasting legacy for my family? Knowing the answers to these 10 questions, before you engage an estate planning attorney, will ensure that your estate plan will really work for you and your family, in 2010 and beyond, when your family needs it most.